Will you get a load of this view! It’s been almost six years since I moved into this apartment, and I cannot count the number of sublime sunsets. I’m going to try to count anyway. The quick math says approximately 2000 sunsets total since I moved in. For the sake of argument, let’s assume that on average I personally witnessed at least one beautiful sunset every other week. This is a reasonable figure despite the notorious Seattle gray, considering that the lulls are offset by stretches in the late summer with weeks of nothing but epic sunsets. Even when it’s overcast, the sun can sneak under the cloudcover as it sinks into the Olympic Mountains, creating something like a Rothko canvas of purple black over pink red. I’m watching the word count as I type this and with the help of my trusty calculator, I can safely say that, for each word in this post, I have probably seen one perfect sunset from this window. Thank you, Belltown, I cannot repay you. I’m going to try to repay you anyway. This will be hard to leave behind. It is starting to feel like every American company has it in for travellers. Cell phones — already expensive when you use within our borders — become money time bombs if you even turn them on in another country. Banking is the same way. Your super-friendly neighborhood bank that charges you no fee for checking is happy to slap a 3% transaction fee onto every charge you make abroad. Plus a $5 flat fee. Plus a less-than-ideal conversion rate. Plus out-of-network ATM fees. I guess they reason people who can afford travel will be so busy seeing the sites that they won’t analyze their bills. I’m hoping to make it the whole year with no surprise fees. First step: phones. 1) Port phone # to Google Voice. Then friends and family can call my American number and reach me anywhere in the world. 2) Get a quad-band GSM phone. I landed on the Motorola Blur because it had a nice keyboard and was $500 less than an unlocked iPhone. 3) Order SIM cards. I got a pay-as-you-go T-Mobile plan that is good until I leave (and then it just expires!). I set up my Google Voice to forward to that number. Now I need to order SIM cards online for the countries where I want to use my phone. From what I’ve read, you CAN buy SIM cards in-country, but the the wait times are very long and it can take 5 days to get your card. Whereas, if you already have the SIM card, just buying minutes you can do on any street corner. 4) Google Voice does not forward to international numbers (frown), so must forward GV to Skype and then forward that. 2) Keep current accounts linked to Capitol One for paying bills at home. As long as they have no monthly fees. With those two in place, we have hopefully subverted many surprise fees just waiting to pounce when we depart. A long time ago we were introduced to a map of the world that made Greenland look the size of Africa. Most of our lives, this was never questioned. Now, we know better. Now, we are going out into the world to measure it by hand. Welcome to the Equal Area Project. We’ll be leaving soon. Equal Area Project is Eric and Rachel. We are traveling around the world beginning October 26, 2011. Starting on October 26, we depart to the Yucatan. From there, we will not relent. Mexico and Ecuador, then on to hit midnight on the dateline for New Year’s, then Southeast Asia, over to the Indian Subcontinent (with a stint in the Himalayas), and finally touched down next Spring in the Mediterranean with no ticket home. Until then, we’re getting shot up with vaccines and lasers, documenting, calibrating, packing, glowing. We encourage you to pay attention, starting… now. 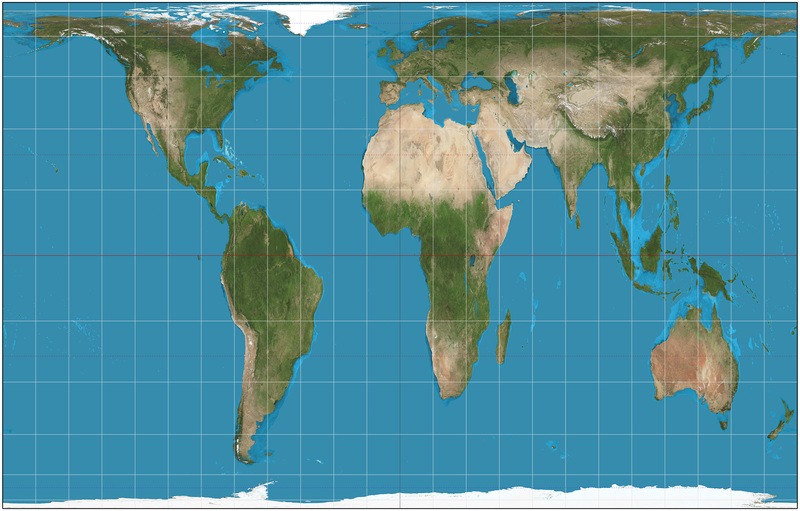 The world on Gall–Peters projection. 15° graticule. Imagery is a derivative of NASA’s Blue Marble summer month composite with oceans lightened to enhance legibility and contrast.